Several Democratic presidential candidates defended freshman Rep. Ilhan Omar (D., Minn.) on Friday after President Donald Trump and Republicans slammed her for minimizing the September 11 terrorist attacks to "some people did something." Speaking to the Council on American Islamic Relations at a March fundraiser, Omar talked about the difficulties Muslims faced following the Sept. 11, 2001, al Qaeda attacks. She claimed they saw their civil liberties infringed upon, and she referred to the events as an instance when "some people did something." Her point was to praise CAIR for organizing in response. After the video went viral, Republicans and some Democrats in Congress voiced their disgust at the comment. 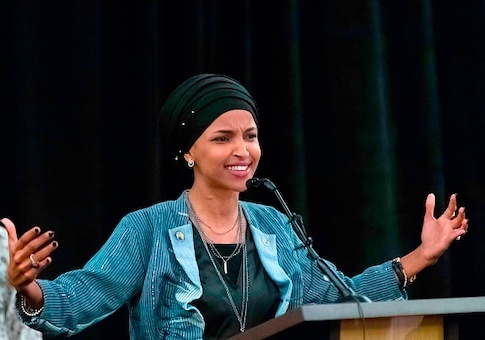 Trump tweeted out a video of Omar's comments followed by footage of the airplanes flying into the Twin Towers and then the towers collapsing, sparking outrage from Democrats who believed criticism of Omar's comment was "inciting violence" against her. "The President is inciting violence against a sitting Congresswoman—and an entire group of Americans based on their religion," Sen. Elizabeth Warren (D., Mass.) tweeted. "It's disgusting. It's shameful. And any elected leader who refuses to condemn it shares responsibility for it." MoveOn.org, a large progressive activist group, also rushed to the defense of Omar in a tweet thread, calling her courageous and a "champion of the U.S. House." Omar champions democracy reforms, ending the culture of endless wars, calling out white supremacists & war criminals in the @realdonaldtrump administration, & fiercely defending human rights of immigrants & asylum-seekers. This entry was posted in Politics and tagged Amy Klobuchar, Bernie Sanders, Donald Trump, Elizabeth Warren, Ilhan Omar, Jay Inslee, John Hickenlooper, Pete Buttigieg, September 11. Bookmark the permalink.